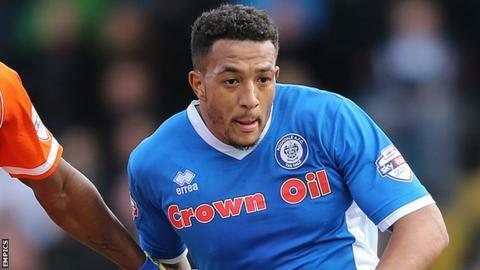 Rochdale boosted their League One play-off hopes with a comfortable victory over relegation-threatened Blackpool. Dale took the lead against the run of play just before half-time when Ashley Eastham headed in from Donal McDermott's cross. Joe Bunney turned in Rochdale's second from close range after the visitors had failed to clear a corner. And Nathaniel Mendez-Laing slotted home to seal the win and extend Dale's unbeaten run to three games. The result leaves Keith Hill's side eighth in the table, four points outside the play-off places, while Blackpool are two points adrift of safety in 21st. "I'm pleased with the player's application and attitude. These games now aren't about technical ability or tactics, this is about endeavour pride and sacrifice and putting everything into a game. "At this time of the season, whether you're fighting relegation or trying to get promoted, that's all it's about - heart. "Results are important not performances, but in the second half I thought we put in an excellent performance." Match ends, Rochdale 3, Blackpool 0. Second Half ends, Rochdale 3, Blackpool 0. Martin Paterson (Blackpool) wins a free kick in the attacking half. Emmerson Boyce (Blackpool) is shown the yellow card. Attempt saved. Peter Vincenti (Rochdale) header from the centre of the box is saved in the top centre of the goal. Corner, Rochdale. Conceded by Clark Robertson. Attempt missed. Grant Holt (Rochdale) right footed shot from outside the box is close, but misses to the left. Foul by Martin Paterson (Blackpool). Substitution, Rochdale. Andrew Cannon replaces Donal McDermott. Attempt missed. Peter Vincenti (Rochdale) left footed shot from outside the box misses to the left. Substitution, Rochdale. Peter Vincenti replaces Joe Bunney. Attempt saved. Nathaniel Mendez-Laing (Rochdale) right footed shot from outside the box is saved in the centre of the goal. Foul by Ashley Eastham (Rochdale). Attempt missed. Joe Bunney (Rochdale) right footed shot from outside the box misses to the right. Attempt saved. Mark Cullen (Blackpool) header from the centre of the box is saved in the bottom left corner. Attempt saved. Michael Rose (Rochdale) left footed shot from outside the box is saved in the top centre of the goal. Attempt missed. Callum Camps (Rochdale) right footed shot from outside the box is high and wide to the right. Substitution, Blackpool. Martin Paterson replaces Danny Philliskirk. Foul by Donal McDermott (Rochdale). Goal! Rochdale 3, Blackpool 0. Nathaniel Mendez-Laing (Rochdale) right footed shot from the centre of the box to the bottom right corner. Assisted by Donal McDermott. Attempt saved. Nathaniel Mendez-Laing (Rochdale) right footed shot from the centre of the box is saved in the centre of the goal. Corner, Blackpool. Conceded by Jamie Allen. Corner, Rochdale. Conceded by Brad Potts. Foul by Danny Philliskirk (Blackpool). Danny Philliskirk (Blackpool) wins a free kick on the right wing.